← How do we slow down? In any case, they were good. I felt so full, but I loved all the rich flavors. Maybe we will have to do a week where on Monday we have quesadillas, Tuesday: tacos, Wednesday: nachos, Thursday: enchiladas, what should we have on Friday. They are all the same ingredients. 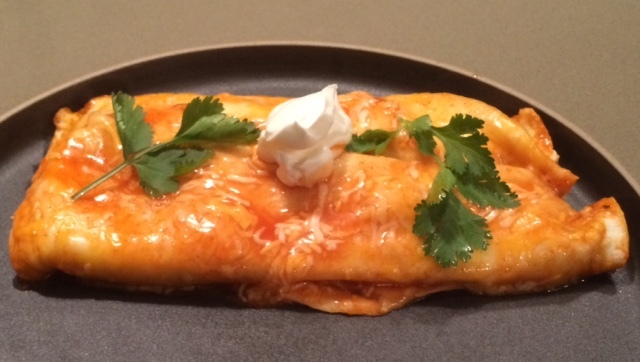 I can now say that I have had enchiladas, and this recipe was oh so good. We did not add the garlic (well I should say Chris did not add the garlic) and we cut the recipe in half. Next time we might make them and add beans and rice. Although if we do I might only be able to eat one enchilada. Preheat oven to 400 degrees F. Lightly spray a 13-by-9-inch baking pan with cooking spray. Heat oil in a non-stick skillet set over medium heat. Add onion and garlic and stir until softened, about 2 minutes. Add tomato sauce, chicken broth, chicken, cilantro, jalapeños, chili powder, cumin, oregano, and salt. Simmer until slightly reduced, 4 to 5 minutes. Remove from heat. Lay a tortilla flat on a clean work surface. Spread a generous tablespoon of goat cheese in a stripe down the center, then top with about 1/3 cup of chicken mixture. Roll up and place, seam side down, in prepared baking pan. Repeat with remaining tortillas. Pour enchilada sauce over top and sprinkle with grated cheese. Cover with aluminum foil and bake until heated through and cheese is melted, about 20 to 25 minutes (if you like your cheese speckled with brown, remove the foil during the last 5 minutes of baking). Serve warm, topped with fresh cilantro and a dollop (or splatter) of sour cream if desired. Adapted from the Skinnytaste Cookbook.